How many Glassics were made? As the Annex evolved over the years, I have made charts, and then lost them, or could not find them myself on the website, so as of 2012, there are TWO charts that are as accurate as we can hope for now. A general chart on the HISTORY page, which gives the general quantity by generation, and the total quantity built (as best we can tell). A chart by year, below on this page, using the low and high VINS of cars that have been "found" -- there are no quantities on this chart, because we don't know which side of the year break the missing gaps would fall. TIMELINE -- Click or scroll down for the yearly changes to the Glassic cars, and company events. minor parts modifications and upgrades that happened throughout. Suspension changes wider wheel stance. The International Scout based Glassics. The first generation began with the first Glassic in 1966 (#101) through 1971. The front and rear suspension, and the frame, for that matter, came from Scouts. The early Ford-engined Glassics, which used a Tube Axle from Minneapolis Auto Specialties, and Econoline spindles and brakes. car 689 --Front end - Taken from under the driver's side front fender, looking toward the back of the car. Car 838, the McWreck. 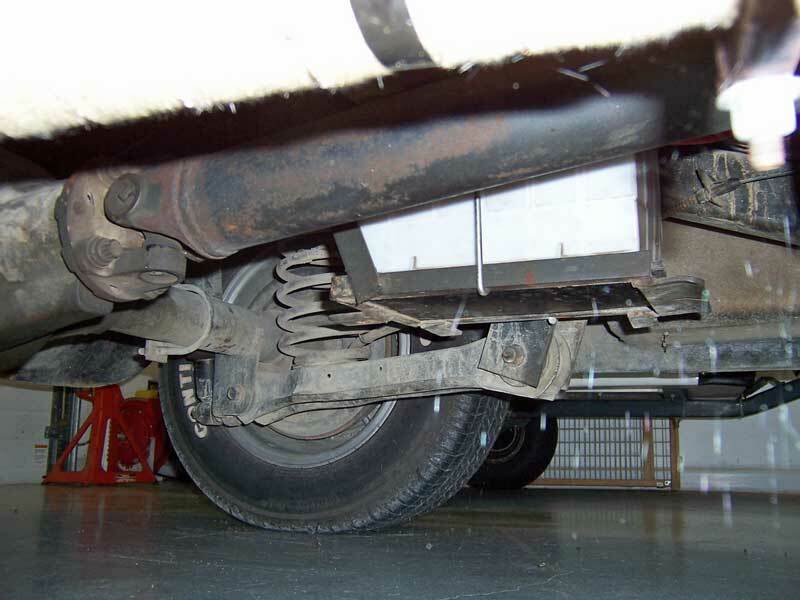 Rear suspension, taken from the driver's side. The Replicars which used a Pinto cross member and Pinto / Mustang II spindles and disk brakes. Began sometime in 1977 through ?? we don't know, but likely 1979 or 1980. 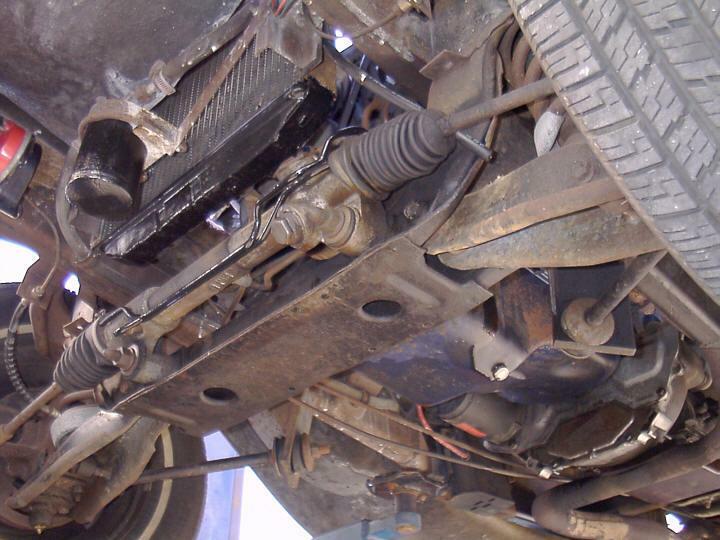 – the rear suspension was a Trailing arm, fabricated piece. 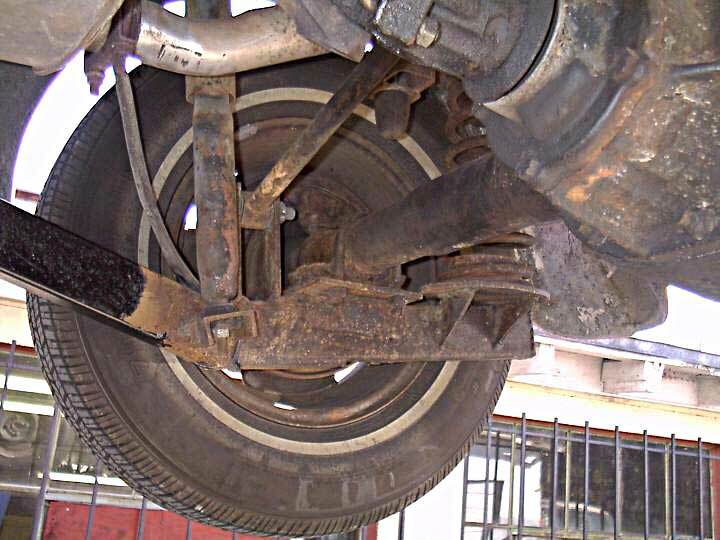 at the left side of the picture -- the very old shock absorber is in front of the axle. 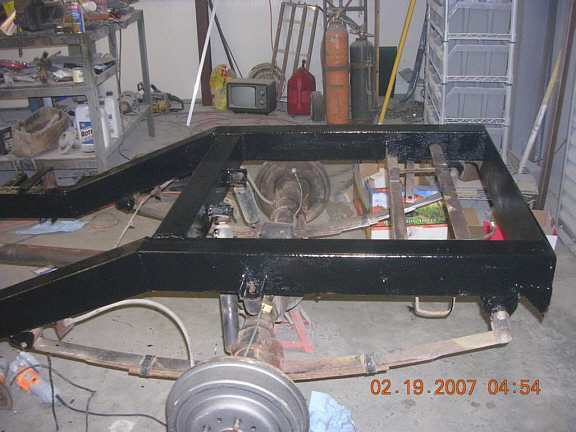 The fabricated front cross member 2 1/2 inches wider than generation 3, and a Fairmont rack. The fourth generation began in 1979 or 1980 through the end of production in 1981. The "fabricated" cross member was based on the Pinto cross member. The rear suspension was also changed for generation 4 to a 4-bar, using a Fairmont rear axle, which was wider and went with the wider front end – all of which made the wheels sit further out in the fender wells. Car 1505 -Front of the car is to the right -- taken under the passenger side running board, looking toward the driver's side rear wheel. Coil is in front of the rear axle. The changes to Fairmont parts was since Mustang II was not being continued, and parts were not going to be available for newer cars. Serial numbers - these are the lowest and highest numbers that I have evidence of. As new information comes in, I will close the gaps. so we don't know which year they were made. ordered, but titled the next year when delivered to the customer. Colors available Flag red, jet black, snow white. Cars had headlights attached to fenders -- no light bar. 1967 From other (also undated) literature Items in RED differ on the two brochures -Engine: International 4-152 4cylinder. Gross BHP: 93.4 @ 4400rpm. 12volt 32 amp alternator. Cooling system 11.6 quart capacity. Radiator frontal area 300 sq-inches. Semi-elliptic steel leaf springs. Tires: 7.35x15 4-pr. Brakes: Hydraulic, single-cylinder, double piston front and rear. Size 9x2" front and rear. Total lining area 137 sq ". Steering: S-12 gear with 17" steering wheel. Transmission: T-13 3-speed synchromesh, direct. Ratios 3.34, 1.85, 1.0-- 4.53 reverse. Clutch: 10" 6-spring single-plate. Hydraulic control, vibration dampener. Fuel tank 17 1/2 gallon aluminum. Total car weight 2310 lbs. Quoted in literature "Parts and service for the complete chasis (radiator, engine, transmission, differential, brakes, wheels and frame) available at all International Harvester Scout dealers." a March 1974 Hemmings ad claimed for the 1973 cars "original suggested retail $8300"
1975 no cars located yet -few were produced the first half of the year, and none the second half due to bankruptsy of the company. date confusion. Rebirth of the company as Replicars. No cars sold this year, although a few 1976's may appear with a 1977 manufacture date. The earliest Replicars had the Phaeton gas filler on the SIDE of the rear hump. Gas filler moved from the side of the rear hump to the rear fender. 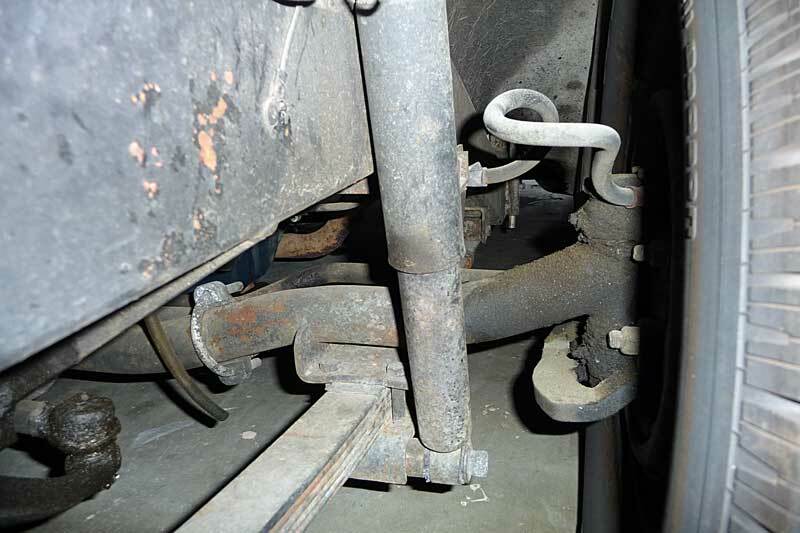 Front leaf springs, air conditioning Later in 1977 cars appeared with Coil spring s in front. Drum brakes - front and rear. In Feb. 2008 I asked Joel to help me identify how you could tell the difference between the different year Replicars. (If there was no VIN tag, of course). Here is his reply - remember, this is 30 years after the fact. First Replicar change was to Pinto (Mustang II) front cross member w/ coil springs, disc brakes, & a Mustang II rack -- and a fabricated swing arm coil spring rear suspension, disc front, drum rear, and 4 lug wheels w/ 2" x 3" tubing chassis, and about 2" more wheelbase to get the front tires under the crown of the front fenders.. When this happened is anyone's guess.. We didn't keep records of this. Once I figure out what those changes LOOK like, we can try to zero-in on when the change occurred by comparing with known VIN cars. 1979 Somewhere between 1979 and 1980, front and rear suspension changed. See Generation Four above. Car # 1509 reported in in 12/2012, with a production date of 10/10/81 - not surprising since VINS have appeared out of order before - possibly when the car was ordered, not finished.